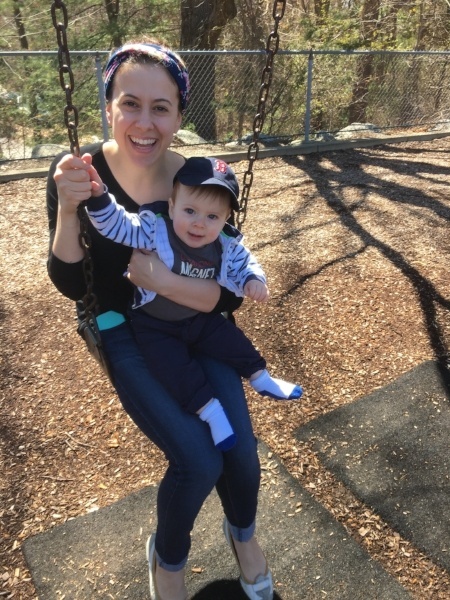 In this HR for Humans story, Laurie Aquilante—a Senior Manager of Marketing at HubSpot—reflects on her first months as a working mom. For more stories at the intersection of work and life, follow @namely_hr. You can also submit your stories here. I have always put my career first. Fortunately, I found a partner in life who supports that completely. My husband and I had long talks before ever having children that when the time came, I would likely continue working, and he would likely be a stay-at-home-dad. We both felt pretty good that we were bucking the “norm” and living in a bit of a role reversal. Yes, bucking the “norm,” even though it’s 2017 and not 1955. It turns out that it’s not actually that simple. Not that simple because there are differences for men and women when it comes to parenting a newborn, especially one that you choose to breastfeed. And not that simple because the story of what it means to be a working mom is still being written. The picture isn’t quite complete. Recently, my son got a horrible cold, and it was his first really big illness. The pediatrician told us that nursing him as often as possible, ‘fresh from the source’ so to speak, would help him get better faster. I realize to anyone who doesn’t breastfeed that might sound a little strange, but fortunately, I’m through all the stages of breastfeeding emotion—from denial to don’t poke the cow. But I digress. I was in a meeting, and I was a little frantic because I had to leave exactly at five to catch my train to get home to him. I had a big meeting the next day, and I was really stressed about the decision whether to go into the office or work from home. The person I was meeting with gave me some sage advice: It’s up to us—working moms right now—to create the picture of what it means to have a family and a career. It’s our story to create. As I went through my concerns, she advised: If the picture of a working mom in 2017 means that I work from home on a day that my son is sick so that I can nurse him—maybe I do that between calls, maybe I do that while I’m reading email—however I make it work, it’s up to me. No one is going to tell me exactly how that should go, and it’s my responsibility to the women who come after me to forge a new path. At the time I thought: “It’s 2017, and we’re still figuring out what working motherhood looks like? This is my story to tell?” But after talking to other women about it, I’ve realized that it’s true. This conversation stuck with me, and it was really powerful to make the mental shift from being anxious and worried to believing that I could, and would, figure it out, and that I could be an example for other working moms. The next day, I worked from home with my sick baby and at one point, he fell asleep on me. I didn’t want to move him, so I sat in my bed with the baby on my chest and my laptop next to me, and worked while he slept. That’s the new picture of working motherhood—it has many faces, but that’s one. It doesn’t mean I’m any less productive than if I was sitting at my desk; in fact, I’m more productive, and I’m happier because my baby gets what he needs, and I still get to do my job. Another face of working motherhood is pumping at work. Yes, it means I need to be more disciplined about my schedule, but I can take meetings and work while I pump. Many well-meaning colleagues have assumed that I need to move meetings around to accommodate pumping or have been shy about saying the word “pumping.” I recently wrote about this in more detail in “The Truth About Pumping at Work: What I Wish My Colleagues Knew” to help shed some light on the issue and move the conversation forward. The point is that “pumping” is not a bad word. If I say I can work and pump, then I can. This is working motherhood today. It’s me taking a conference call while sitting in the mother’s room pumping. It’s me working on a deck for a new presentation while my baby sleeps on my lap. It’s me leaving early so I can nurse my son when he’s sick and putting in the extra hours another time. It’s shutting off my laptop between 6 and 8pm because that’s the time I have with my baby before he goes to bed. And sometimes it’s even doing email on a Saturday during his nap time. The landscape is changing quickly, which is amazing. Every mom who chooses to be vocal about her story contributes to a more open dialogue, like these amazing women sharing stories about returning from parental leave or how the difference between maternity leave and paternity leave impact so much of the family dynamics. I see the tides changing with every new person who is willing to come forward and say: This is my life as a working parent, and this is how I manage it all.